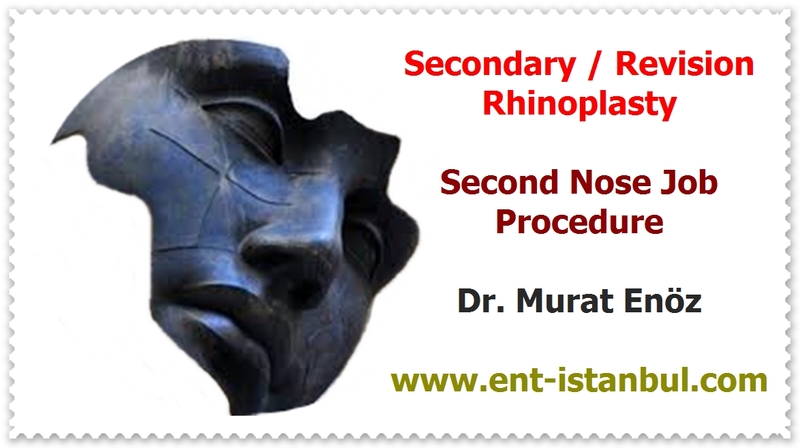 Revision nasal aesthetic surgeries are more difficult and more detailed than primary nasal surgeries. Since septum cartilages in the nose are sometimes used extensively, there may not be enough cartilage tissue to correct the problems on the nose and in this case the cadaveric rib cartilage - which is transferred from the patient's own ear (Cadaveric costal cartilage - irradiated cadaver rib) can be used. 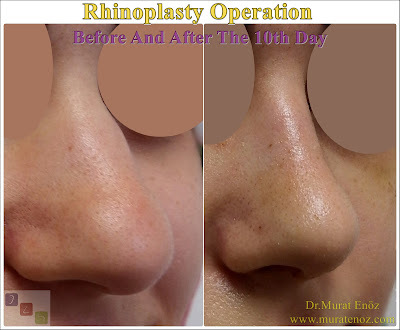 We planned revision nose aesthetic surgery with a nasal augmentation that had been twice nasal aesthetics and had asymmetry on the back of the nose, roaring nasal droop, spreading at the tip of the nose, irregularity of light on the back of the nose, and cadaveric rib cartilage. At the beginning of the procedure, the "Columellar Strut Graft", which is placed at the tip of the nose, is being prepared from rib cartilage with the oblique incision. To end the short side view, a two-sided "septum extension graft" is prepared for extending nose axis and the nose tip down wards. The grafts are placed and stood in place. The remaining rib cartilage is broken down into small pieces (freshly squeezed instead of crushed cartilage) with fresh blood from the patient, and cartilage dust-blood mixture is spread under the skin on the back of the nose. With the help of cold serum and massage, spreading of the mixture under the skin is provided. The columellar tip of the nose is stitched with the skin incision area, absorbable suture material. Intranasal silicone splints are placed and the operation is terminated to nasal bandage and place the external splint. I placed the nasal cartilage's own membranes in the shape of a triangle again on the same site. At the same time, the correction of the cartilaginous curvatures, which make nose reduction and internal breathing difficult, was also done. Revision nasal aesthetic surgeries are like opening a surprise box. It is quite funny and thought-provoking if perfection guarantees are given or non-scientific expressions such as "guaranteed nasal aesthetics" or "revision nose surgery excellence guarantee" are written. It should not be forgotten that the procedure is performed on a alive tissue, that the cartilage and bone memory are present, and that each person's healing properties may have differences that can effect the result. Thinking about the same nasal aesthetic operations with a computer program (like photoshop application) can cause serious frustrations after the operation.